Members of Congress expressed concerns at recent hearings over the deep budget cuts proposed for the National Oceanic and Atmospheric Administration’s weather and climate programs, with some pointing out they come in the wake of unprecedented destruction from the 2017 Atlantic hurricane season. At recent congressional hearings, lawmakers questioned the wisdom of the Trump administration’s proposal to cut the National Oceanic and Atmospheric Administration’s budget by over $1 billion. The fiscal year 2019 budget request for NOAA is $1.35 billion, or 23 percent, below the level recently appropriated for fiscal year 2018. Members on both sides of the aisle expressed concerns to Acting NOAA Administrator Timothy Gallaudet about how such deep budget cuts would impact the agency’s research, forecasting, and observational capabilities. Some, for whom the record destruction from the 2017 Atlantic hurricane season was still fresh on their minds, asked Gallaudet to articulate what NOAA needs to effectively prepare for and respond to future hurricanes. Acting NOAA Administrator Timothy Gallaudet testifies at an April 12 Senate hearing on lessons learned from the 2017 hurricane season and preparations for the 2018 season. Rep. Robert Aderholt (R-AL), who presided over an April 11 House Commerce, Justice, Science Appropriations Subcommittee hearing in Chairman John Culberson’s (R-TX) absence, said in his opening statement that the panel will carefully review the budget request “to ensure that we are adequately funding mission-critical expenses at NOAA in 2019.” He pointed out the administration’s budget proposals were formulated before a bipartisan budget agreement enacted in February raised federal spending levels. Culberson also made note of this fact at a March 20 hearing on the budget for the Commerce Department, which houses NOAA. This shortsighted approach to saving money would only result in potentially catastrophic consequences further down the road. I do not say this lightly, but in the long-term we will be paying an even higher price for these cuts in terms of money and lives lost. This makes no sense to me. 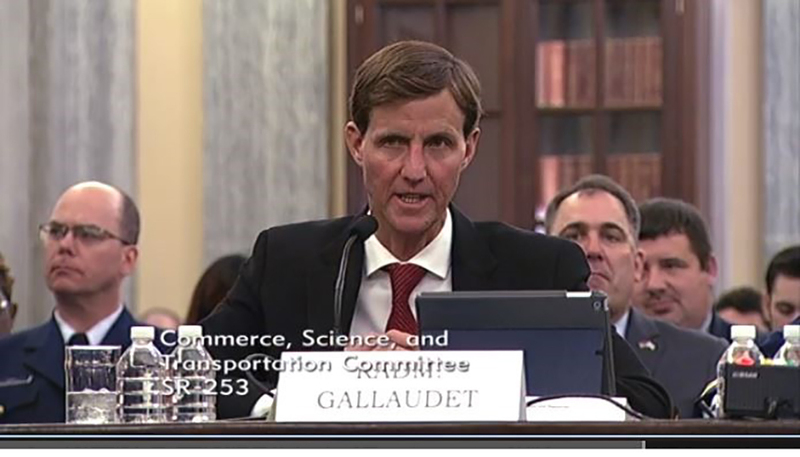 In his opening statement at the April 11 hearing, Gallaudet explained that the $4.5 billion budget request for NOAA focuses on two priorities. The first is “reducing the impacts of extreme weather and water events, by implementing the Weather Research and Forecasting Innovation Act,” which was enacted last April. The second is increasing sustainable economic contributions of U.S. fisheries and other ocean resources. Gallaudet also touted NOAA’s successes over the last year in responding effectively to the record-setting hurricane season, saying the agency’s efforts “saved thousands of lives despite Hurricanes Harvey, Irma, [and] Maria, being three of the five most costly hurricanes in history.” He also highlighted the “perfect” recent launches of two flagship weather satellites — Geostationary Operational Environmental Satellite-S (GOES-S) and Joint Polar Satellite System-1 (JPSS-1). This model out-performed the European models for the hurricane track forecasts for the three Category 4 hurricanes that made landfall [last year]. Our goal is to regain world leadership, take number one back for our weather modeling. We're on track to do it. We expect to do that before 2020. Committee members questioned why these successes and goals would elicit plans to slash funding for the agency. What is your strategy for maintaining the United States’ competitive advantage in the area of advanced technology relevant to the NOAA mission … with such dramatic reductions to the budget? Gallaudet responded that the administration is committed to prioritizing funding that has a bearing on national security. When they made decisions on what programs to cut, he said they opted to preserve “core government work” while reducing programs they saw as either redundant or that primarily supported grants to states or local stakeholders. Rep. Grace Meng (D-NY) criticized the proposed cuts to NOAA’s high-performance research computing capabilities, including the elimination of support for the Jet supercomputer at the Earth System Research Laboratory in Boulder, Colorado, and reduction in support for the agency’s supercomputing facility in Fairmont, West Virginia. When Rep. Matt Cartwright (D-PA) asked specifically about the proposed cuts to hurricane forecasting research, Gallaudet replied that the administration made reductions in areas they thought are redundant or already have sufficient capability. At an April 12 Senate Commerce, Science, and Transportation Committee hearing on preparations for the 2018 hurricane season, Ranking Member Bill Nelson (D-FL) also inquired about hurricane forecasting. Gallaudet said NOAA has made "great strides" in predicting their intensity and tracks. "Our track accuracy [has been] the most accurate for a hurricane track forecast by about 25 percent, over the last five years," he added. He also noted that Congress provided NOAA with $200 million in one-time funds for weather programs as part of two supplemental appropriations packages connected to the 2017 hurricane season. NOAA will be devoting a major chunk of those new funds to further improving hurricane forecasting, modeling, and observations, he said. The point I want to make is [budget] sequestration had not only been devastating to [the Department of Defense], but it'd been devastating to programs like this that really are also very much involved in security of Americans, safety of Americans. … Thank you for acknowledging that we did something that was much more adequate to get the job done this year. There is much in the so-called nondefense discretionary budget that has everything to do with making Americans safe abroad and making Americans safe at home. At the April 11 hearing, Cartwright also asked Gallaudet why his top priorities for NOAA had not included a reference to climate change and whether this should be cause for concern given that “for years NOAA has played an essential role in deepening our understanding of climate change.” Gallaudet was previously questioned about the absence of an explicit reference to climate change in his top priorities at a NOAA Science Advisory Board last fall. When Cartwright pressed further on his concerns about the White House’s treatment of climate change, Gallaudet reassured him that the White House has “not zeroed out our climate work,” pointing to the Climate Prediction Center’s publication of seasonal and long-range outlooks as well as recent collaboration between NOAA and the U.S. Navy on Arctic sea ice forecasting. In addressing similar concerns brought up by Sen. Maggie Hassan (D-NH) at the April 12 hearing, he added that the White House is “supporting much of our Arctic-related research that is driven primarily by climate change,” and that he has not been directed to eliminate or remove the phrase “climate change” from reports. I want to have confidence in you, Admiral Gallaudet, and I do. You are clearly a good scientist, an able leader. … But looking at this budget, I just don’t have confidence in the administration. … And I think this is a budget written by climate deniers that would derail the great work that has been going on, largely under your leadership at NOAA. And I hope this committee can fix the serious problems in this budget proposal. With the successful launches of GOES-S and JPSS-1, the administration is requesting spending decreases for both the JPSS and GOES weather satellite programs in fiscal year 2019, as a planned ramp down of funding. Pointing out that “launches are getting cheaper and space is no longer just the domain of government,” Aderholt asked how NOAA is going to lower the cost of its future observing systems. Gallaudet replied that NOAA is assessing the potential of commercial capabilities as part of an ongoing observation system architecture study. New ways of obtaining observations may include the use of smaller satellite designs like CubeSats or nanosats, he said. Gallaudet also highlighted NOAA’s $6 million Commercial Weather Data Pilot Program, which is exploring the feasibility of integrating commercial satellite data into NOAA’s operational weather models. When Aderholt asked if the pilot is off to a slow start, Gallaudet said it is “a modest endeavor,” and "primarily a crawl-walk-run effort, where we envisioned just looking at one type of data, radio occultation." He added that NOAA would look at other types of data if it continued to receive appropriations for the pilot program. We don’t have a large amount of funds dedicated to it. And it was primarily a crawl-walk-run effort, where we envisioned just looking at one type of data, radio occultation, and then in the future should we receive more appropriations funding to conduct studies like this, we would look at other types of data. NOAA has learned in the first year of the program that “the industry isn’t evolving as fast as we thought it would,” he explained, but added he anticipates the Commerce Department’s work to promote the development of commercial space capabilities will help the industry grow.